Not all adaptations are a recipe for success. For every comic book movie blockbuster or new TV hit series, there are a few misses that pop up. Changing the source material, miscasting, the editing, the acting or the script itself could be one of the reasons the adaptation just didn't work. It's not to say the piece is completely bad - it needs to be viewed under a different lens. Adaptations, at its core, are never as great as the original source material. 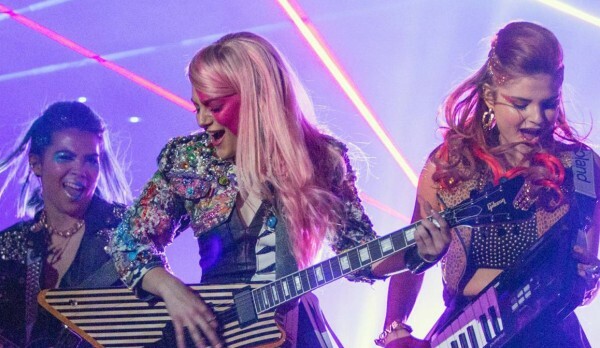 For this edition's movie review, I take a look at an '80s musical adaptation: Jem and The Holograms. The Premise: Jerrica (Aubrey Peeples) is a shy and talented musician who lives with her aunt, sister and two foster sisters. When her sister Kimber (Stefanie Scott) uploads a video of Jerrica singing, going under the name of "Jem", her popularity skyrockets as the video becomes an internet success. Catching the eye of record label mogul Erica Raymond (Juliette Lewis), Jerrica, as well as her sisters, are signed as a new band - Jem and The Holograms - and deal with their newfound success. Jem and The Holograms isn't as bad as everyone initially claims it to be. There are some highlights to the film, like primarily with its soundtrack and themes of sister unity. If you're the type of person who enjoys adding new tracks to their playlist, Jem offers just that. Unfortunately, the positives do end there. Jem and The Holograms suffers from an identity crisis. The film doesn't know what it wants to be! Is it a cheeky parody based on the cartoon? Is it a serious indie flick exploring the music industry and internet trends? The film jumps back and forth between both ideas, essentially confusing viewers of the main plot. In terms of the cast, much of the cast was simply doing lip service - barely showing emotion and merely reading lines. On top of that, the film was never outrageous. (Seriously, Jem was never truly, truly outrageous!) If you're a diehard Jem and The Holograms fan, I would not recommend watching this film as it is a departure from the series. However, if you enjoy musical films and a nice feelgood movie, this could be for you.